Yahoo's newish CEO, Marissa Mayer, recently reversed the company policy that allowed, even encouraged, employees to work from home. This action has generated a lot of news copy, both for and against, and as is now the norm the masses are weighing in via social media. Most views I've read tend to be stridently for or against working from home, with little middle ground: one camp assumes such a policy encourages lazy people to watch Ellen all day while the hard workers toil; the other camp assumes such a policy extracts more output from workers who no longer know when the workday ends. There are endless variations on the theme. I first worked remotely in 1991 while living outside Boston for a Denver-based company, and since then I've seen every permutation and combination of work-from-home policy and I've seen both experienced and novice executives fumble with managing in such an environment. My view is that such a policy is a simple study in microeconomics: if you're clear what outcome you're solving for, the correct policy is easier to choose. Wearing my former CEO hat, here are the issues I think about when deciding whether an employee may work from home. Inequality - Let's tackle this right up front. Few businesses can operate 100% virtually. This means that, sooner or later, some people will have to be centrally located and won't have the option to work remotely. Get over it. Your H.R. professionals will quake at the notion of treating employees inequitably, but that's just one of many reasons H.R. professionals rarely end up as CEO. The fact is, treating everyone the same is a stupid idea. Hersey and Blanchard in their Situational Leadership theory posit that people have to be managed differently based on their individual skill set and the task at hand. One person might need to be micro-managed for a task that another person can handle unsupervised. As I've discussed previously, too often managers make decisions out of a misguided sense of fairness, whether it's cutting all budgets proportionally during down times without regard to profit contribution, or, in this case, refusing to allow a work-from-home policy because if we can't offer it everyone, then we can't offer it at all. Simply put, good leaders focus on what's right for the business and what's right for the individual, and when you have to break ranks and treat someone differently in order to achieve a better outcome, and you can do so without imposing undue hardships on the business, you act. Productivity - Studies have shown that people are generally more productive when outside distractions are minimized. I'd provide a few references here, but it doesn't take a double blind study to agree that limiting the interruptions of phone calls, sneezing co-workers, lengthy commutes, endless status meetings, emails, periodic fire alarm drills and long lunch breaks can lead to increased focus and output. In fact, as many companies have learned, those who work from home often fail to adhere to regular work schedules and often work far more than if they were sitting in an office or cubicle for 7.5 hours each day. But the key is to recognize which tasks can benefit from prolonged and isolated focus, and which tasks are unsuitable. I can't answer that for you, but I have enjoyed success asking my various teams to conduct a self-assessment and recommend which of their jobs could be performed remotely, and I've been pleasantly surprised at the candor and objectivity. And at the risk of beating a dead horse, I have rarely been impressed with my H.R. staff's assessments, primarily because so few of them understand the business, let alone individual job designs or tasks. Will some of your employees occasionally watch television, or duck out for a dentist appointment? Of course. But no workplace, even those with an open floor plan, prohibitions against personal phone calls and restricted access to social media, is fully productive at all times. Also, if you or your managers are unable to hire responsible adults, then I question your own competence. Collaboration - Technology exists that fosters virtual collaboration, whether it's the awe-inspiring Cisco Telepresence video-conference system, the document management systems allowing simultaneous annotation by multiple parties or business-oriented social media like Chatter or Yammer (although let's not get carried away with our virtual tools!) Trouble is, many organizations invest in technology as if its presence alone will somehow change behaviors. 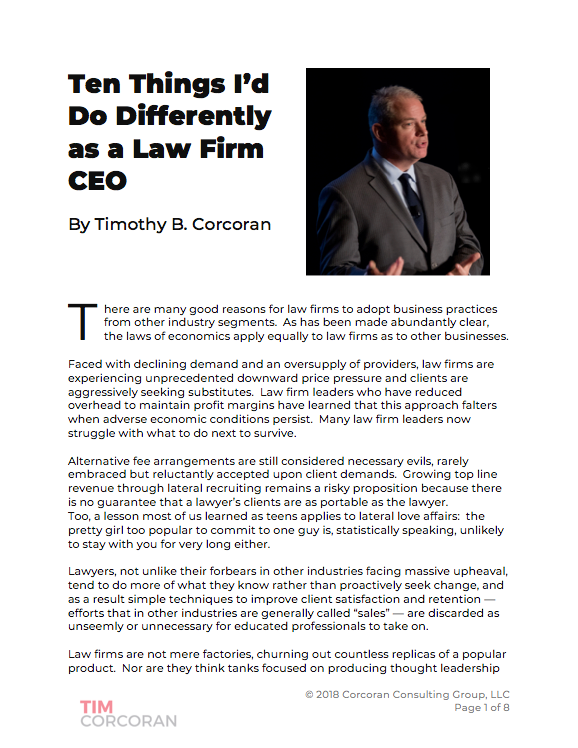 The fact is, where there is a culture of collaboration, people will find ways, even inelegant non-technology ways, to interact; where there is no culture of collaboration, no technology will solve the problem (One example, law firm CRM, a technology asked to solve a problem lawyers refuse to acknowledge; here's another). Some who work remotely will suffer from the lack of creativity and innovation sparked by interaction with others -- often spontaneous and unscripted and unrelated to the given task. Salespeople who primarily operate independently and in the field, but who periodically need more brochures or contracts reviewed, can typically do so without ever setting foot in an office. Programmers who are constantly sharing code or who regularly need input from other teams writing code sets immediately upstream or downstream tend to perform worse when they delay collaboration until pre-set meeting times rather than simply getting up and walking two rows over to compare notes. Again, you'll have to assess the importance of collaboration in your own organizations, but don't underestimate its importance, even in jobs that don't ostensibly appear to benefit from it. Quality of Life - An employee who was facing some troubling family health issues and who needed to be home approached me and asked if he could work from home. The nature of the work he performed for me was pricing analysis, forecasting and modeling, and he could access all systems from home and join meetings by phone or, with sufficient time to plan, in person. He was far too valuable to lose, and his remote working arrangement posed no burden to the company (other than feelings of inequity from other cubicle-bound colleagues), so I agreed. For quite some time he was able to attend to his family issues and deliver a quality work product. When his situation changed, he returned to the office, grateful to his forward-thinking employers for the opportunity. Without question, the loss of income would have burdened him as would the loss of his specialized expertise have burdened us. It was an optimal arrangement. For me, even when I was a HQ-based executive, I periodically worked from home in order to avoid the stress of my harrowing hour-plus commute on the highways of New Jersey. Simple common sense suggests that, all else being equal, a happier employee is a more productive, stable employee. Your own calculus may differ. To me this is a fairly straight-forward linear programming equation. Factor in the things that matter to you - cost, quality of life, productivity, collaboration, equality, etc. - weight the factors accordingly, determine specifically what you're solving for, and do the math. If cost savings is what matters most, you may choose a different path than someone focused on employee retention or someone focused on a short-term max productivity to push a product out the door. And don't invite the contribution of the silly protectors of the status quo, the H.R. staff, unless they can add demonstrable value. Whatever you choose, make it a rational choice based on a variety of factors. And if you choose to conduct this analysis at home on your comfy recliner while watching funny daytime TV, you have my blessing.